Traveling afar? Keep us close! One of the neatest ways to use all the great technology and tools available on the internet is to document experiences and share them with others. There are tons of ways to do this, and today we are sharing some of our favorites! Blogging: Blogging is such a great way to get out there and share your experiences, opinions, ideas, and basically inspire (and be inspired!) by others on the internet. Incorporate videos, posts, photographs, maps, and anything you want to share about your trip (the list is really endless!) Blogs are great because they combine all of these elements in one easy location for others to follow and keep in touch while you are busy traveling the world. Google Maps: If you are a Google Maps user, you may have noticed some of the pretty neat elements they’ve begun incorporating into maps: photos, videos, landmarks complete with descriptions, and custom-made maps created by Google users for others to explore and share. Creating a Google Map of a trip (especially if you are hopping around place to place) is a great way to document your travels and share them with others so they can see some of the same things you were able to experience! We have so many ideas we’d love to share with you if you are looking to incorporate multimedia into really any of your experiences. You don’t have to travel to Europe to create a blog or go on a backpacking trip to create your own Google Map. These awesome tools are at your fingertips waiting for you to become inspired, create and share! Check out one of our favorite tools! Posted on March 26, 2013 by Kara McElwrath | Comments Off on Check out one of our favorite tools! Jing is such a useful and neat tool, it’s hard to believe it’s FREE! While you do have to download the software, Jing will surely be something worthwhile. It allows users to create annotated screen captures instantly, and create screencast videos. Jing allows users to capture all or part of images and add text, draw, or highlight text. They can then be shared with students on Blackboard in class notes! UIS faculty, staff and students also can take advantage of Camtasia Relay – but for folks not associated with UIS, then Jing is an amazing free tool! Comments Off on Check out one of our favorite tools! It’s pretty clear from our blog that we are huge fans of infographics! So you could imagine our excitement when Sliderocket just released this awesome feature: templates to create your own infographics! Infographics are a great way to share information in a unique and attention-grabbing way. Mix graphic visuals with pertinent information, and you’ve got yourself an effective infographic to share on your blog, website, twitter and more! One of the coolest features about Sliderocket’s infographics is that they are animated, complete with transitions and all! Check out one we’ve created here! Posted on December 17, 2012 by Jessica Gaido | Comments Off on The Best of 2012! If you use Google Search for just about anything and everything, then MentorMob may be a great tool for you to try—bypass all the “not useful” information that pops up in your Google Search, and get the most relevant information instantly in a playlist created especially for your search! Pinterest has really grown in popularity this past year, and users have really expanded the ways in which they use Pinterest and utilize their boards! This is a must-have tool for anyone who enjoys surfing the web—pin ideas directly from websites, or browse boards from other users in Pinterest. It’s great for inspiration, knowledge ,and everything inbetween! SendHub is a great solution for communicating outside the classroom with your students. At no charge, users can have a free SendHub account, and join a group where they can send and receive group wide texts! We wish you a safe and happy holiday and New Year! Comments Off on The Best of 2012! Exactly how big is “The Cloud”? Posted on December 9, 2012 by Jessica Gaido | Comments Off on Exactly how big is “The Cloud”? There seem to be so many internet companies out there giving away storage space in the cloud for your use—Google, Dropbox, Box.com, and tons more. You have to wonder, exactly how much space is actually out there? 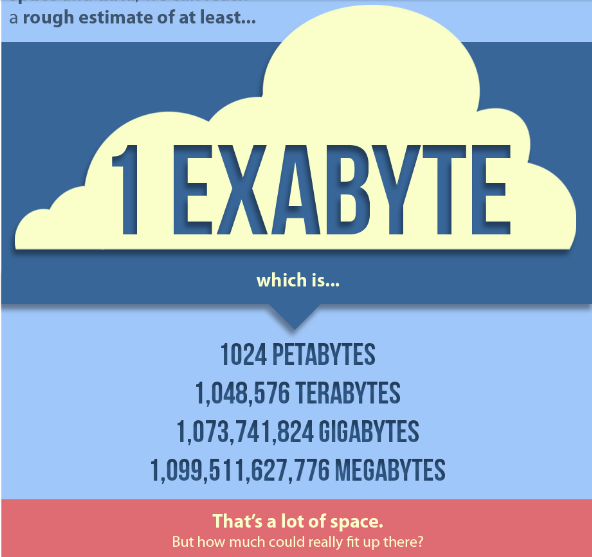 Check out this infographic we’ve found that puts things into perspective in regards to exactly how much space is out there! And remember, we offer many different solutions for Cloud storage for faculty, staff and students at UIS! From Box.com to Google Drive to eDocs, you are able to store your documents on the cloud and access them from wherever you may be! If you would like to learn more about these programs, check out our website, or feel free to contact us with any questions or if you’d like help to get started. Comments Off on Exactly how big is “The Cloud”? You may think you know Prezi, but do you really? Posted on October 28, 2012 by Jessica Gaido | Comments Off on You may think you know Prezi, but do you really? If you follow our blog, Prezi is probably familiar to you. The free-web based presentation tool has given PowerPoint presentations a run for their popularity by offering a new, exciting point of view. Prezi is entirely different than a PowerPoint and can engage audiences in a unique way, and capture their attention. Now, although we’ve talked about Prezi quite often, we’ve got some new ways for you to use Prezi in your classroom! 1. Add an arrow pointing to a key detail in an image. Click on the arrow while presenting your Prezi, and your Prezi will zoom in until the tip of the arrow fills the screen! Point to a particular part of an image, or whatever you wish to focus in on. If you’re looking for a tool or program to use to create mindmaps, look no further! Prezi is your blank canvas, and your mindmap can be set up however you wish! Add images, text, videos, and frames to organize your thoughts. If you have a PDF you need to go over with your class, you can upload it to Prezi and then zoom on different areas, add text over it, etc! Comments Off on You may think you know Prezi, but do you really? Kick off the year with some new Web Tools! The start of the school year is a fresh, new start and opportunity to try some new things in the classroom. Here are a few free web-based tools for both you and your students to check out! This free web-tool allows users to create a “video story” in less than five minutes. Users can essentially tell a story through Google searches. Add music, and upload your video to YouTube to share with others. Provide students with a prompt-such as a video introducing themselves to the rest of the class-and have them share their videos with the rest of the class! This is a great tool because it combines creating videos with various tools to comment and collaborate with one another. After your video is created, comment with voice, audio, text or video and then share with others so they can comment, too! Be sure to regularly check our blog for the newest tech tips, tools and resources to use in your classroom this year! 3 Things you didn’t know about…Google Scholar! Posted on September 4, 2012 by Jessica Gaido | Comments Off on 3 Things you didn’t know about…Google Scholar! Google Scholar is one of the simplest ways to perform academic searches on the internet. Simply enter search terms in the search bar as you would with Google, and Google Scholar will identify, journal articles and many other scholarly resources. If you are unfamiliar with Google Scholar, check out our handout here! And read on for some of the newest tips! 1: Google Scholar will tell you if your library has access to the article you want. This is an added feature that will tell you if you can access the specific article through UIS. Simply add a Library Preference, and Google Scholar will highlight the articles to which you have instant access! Choose “Library Links” and search for your library and choose “Find Library” (Troubleshooting note: you may also have to be logged in to your library proxy to make this work, but there is help text on the Library Links page). When in Google Docs, under the Tools option on the toolbar in your document, click Research. This will allow you to complete a search on the web. If you select an article from the results that pop up, Google will cite the article from you! You can choose from APA, Chicago, and MLA styles—talk about a time saver for both you and your students! 3: Google Scholar will generate a list of those publications that have cited the article in the past. Seeing the number of times an article was cited is definitely a characteristic many users look for to determine exactly how credible the article is. Next time, try clicking on this number and you will receive a list of all publications that have cited the article! This is a great way to view other resources that may be valuable to the particular topic you are researching. Comments Off on 3 Things you didn’t know about…Google Scholar! 3 Things you didn’t know about…Google Drive and Docs! Did you know that recently Google Docs integrated with Google Drive? These two apps teamed up to create an incredible resource for all users of Google apps. When you download Google Drive, you get a cloud-based storage system providing you with 5GB of free storage space. In addition, Google Docs automatically becomes fully integrated in Google Drive, providing you with the benefits of both. Check out some of our favorite tips! Google Drive has a seriously great talent; it allows you to search your documents and can recognize just about anything. Aside from regular text in documents, this feature will recognize text in PDFs and scanned papers (even newspapers! ), and sometimes even recognizable parts of pictures (like famous monuments). 2: Use the Send To shortcut! A new window will appear with the contents of your Send To folder. Along the left side of the screen, you will see Google Drive. Right click Goolge Drive, and drag it into the folder. Release it, and choose Copy Here. Now Google Drive will be added to your Send To folder! Whenever you want to add a document to your Google Drive, simply right click on the document, choose Send To, and then choose Google Drive! Such a simple shortcut! 3: Access all your Previous Revisions! Ever save a document and wish you had the previous version? With Google Docs, you will no longer have that problem! Google Docs automatically saves every version of your document without requiring any action on your end. From Google Drive, select the file you want. From the toolbar, click More, and manage Revisions. A list of previous version is displayed. Clicking one saves it to the browser’s default download folder. It can then be opened or moved to wherever you want, even back to Google Drive. Are you a master of multitasking? You may want to think again. Check out the (surprising!) facts in this infographic we found about multitasking! Use an app, like Evernote, that allows users to maintain notes (photo notes, voice, text, and more! ), calendars, recordings, and other important information across their devices. Plus, it’s free! Box.com, a new tool launched by UIS this summer, allows users to download and store large files in a cloud, sync them across devices, and then share them with others. This is a great tool that reduces a lot of hassle and eases communication! One more piece of advice that may seem so simple is to organize your apps! One of the largest distractions is what we see, so if apps are organized into categories, then you may not be tempted to play the newest version of Angry Birds when you should be taking notes during lecture. And finally, if multitasking is something you must do, be sure to be smart about when and where you do it! The stats on multitasking and driving, or multitasking and studying show that it really impairs our cognitive ability, so be smart about when and how you multitask! More ways to Prezi-fy your presentations! Now, Prezi has added even more awesome features! These two new features both enhance the visual effects of your Prezi. Now, choose between backgrounds that are not only the basic ones they have offered in the past, but they are 3D! Upload an image you would like to add to your Prezi to be the background, then the 3D wizard will make your image 3D automatically! Even better, you can choose to add up to THREE images and make them 3D…Prezi will then fade in and out of each image throughout your presentation! This touches on the second new feature of Prezi-the ability to fade in and out of content within frames. To read more about these new features, click here! And, as always, feel free to contact us to learn more about Prezi and how you can use it in your classroom! We use the internet so often that sometimes when there’s a glitch, it can be a little difficult to cope. (Trust me; I know…my internet has now been working at my home for the past two weeks!). I remembered an app I had talked about before because of its ability to make situations like this just a little more bearable. I downloaded one of these and it really helped me out so much during this situation, so I thought it would be worthwhile to share in the event that your internet goes out unexpectedly and you do not feel up to spending hours on end at Starbucks. Here are a few options for offline reading! This app (formerly known as Read It Later) is free and simple to use. Pages that are saved for offline viewing are all tied to the same account so you can access them from any of your linked devices! Another free option to try out! Use the built in browser and save pages offline with the icon. Save entire pages including the formatting and images! This is one of the most notable and dependable apps in this area, and if you plan on doing a lot of offline reading, this is your app! Use the built in button within the app’s browser to save pages for offline viewing at any time. Keep in mind, these apps are great for situations other than losing internet connection unexpectedly—think traveling on the airplane, while driving, etc.! Now you can be so much more productive in your “internet-down” time! Tools to use to engage your students! Posted on July 25, 2012 by Jessica Gaido | Comments Off on Tools to use to engage your students! This week, we are doing exactly what we love to do on this blog-sharing some new great interactive resources we’ve found on the web! These free tools are great to use in your classrooms when school starts this fall, and great to share with students as resources that can be utilized outside of the classroom (think Flipped Classroom like we blogged about a few weeks ago!). Like Snag Films or TED, NBC Learn is a great resource offering several educational videos to play in class or share with your students. From series focusing on the changing climate of our world to the science of football, there are several series of high quality of videos and lesson plans available for you to share with your class. This is an all-around great resource for everyone in education. Administrators, teachers, students and parents all have tools and resources targeted towards them. View lesson plans and check out already created curriculums, puzzles, and resources organized by grade level. If you incorporate politics into your educational curriculum, this is the tool for you! C-SPAN Video Library is a place for anyone to access a huge archive of videos from various events. Browse through various categories including healthcare, debates, global climate change, and more. This is a great way to bring in the outside world into your classroom and talk about real issues with your students! Comments Off on Tools to use to engage your students! The tool to stimulate discussion on YouTube! Posted on June 19, 2012 by Jessica Gaido | Comments Off on The tool to stimulate discussion on YouTube! This week’s new tool is one that is integrated with YouTube. We’ve blogged in the past about how valuable YouTube is as a tool in higher education, and this tool makes it even more valuable! YouTube allows users to communicate about videos through short comments that appear on a feed below a video. While this is a good way to share opinions and read the comments others have about the video, it is a limited feature. When it comes to educational videos, users may want to share more than simply short comments. They may have specific questions and desire thorough answers that cannot be covered in a short comment. This is where our new tool, Grockit Answers, comes in! Simply search for a YouTube video and then post a question you have at any point in the video. When others watch the video, your question will appear at the same point in the video that you entered it. Others can then answer your question! When videos are confusing or you could use additional clarification on the material presented, you can simply enter your question for others to answer. This stimulates discussion, thinking, and collaborating with others in an online environment. Be sure to share this tool with your students! It is a great addition to the online learning environment of YouTube. Comments Off on The tool to stimulate discussion on YouTube! We have spent a lot of time on our blog talking about how valuable YouTube can be in higher education—from searching YouTube EDU for educational videos from universities and educational institutions all over the world to having students create and post their own original videos to YouTube. YouTube is a great way to integrate education with the power of social media to reach audiences all over the world. Today, we are sharing a free web-based tool that will increase the functionality of YouTube. It’s called TubeChop and it gives users the ability to trim any YouTube video. You can now select a specific clip from a YouTube video and share it in the same ways you would with original YouTube videos. Simply search for your YouTube video, choose to Chop It, and drag the bars to capture the portion of the video you want to keep. Then click Chop It, and you will be provided with a link, an embed code, and other sharing options (Facebook, Twitter, etc.). TubeChop is just one of the many apps and free web tools that integrate with YouTube, increasing its functionality for you! Be sure to follow our blog for more new and free web-based tools!